NEVADA COUNTY SENIOR PROVIDER’S BREAKFAST CLUB ! Peter Stack, Wolf Creek’s Marketing Director hosts this monthly group meeting for all senior providers in our county. Once a month featuring a different facility host in our area. This group has been going for years and it is always growing. 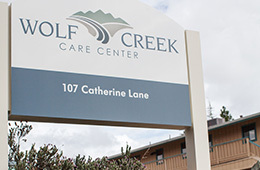 We meet on the 3rd Wednesday of every month in a specific facility including Skilled Nursing and rehab, Assisted Living, Independent living facilities, memory care facilities and our local hospital. This gives all of our facilities a chance to show off our good breakfast food and ambiance. This is always a great time to see each other and network and catch up. Every meeting has a fabulouis guest speaker and this also gives the administrators and staff a chance to brag about what is new! Feel free to contact Peter pstack@plum.com if you are in our area visiting and wish to attend! It’s breakfast party network time! It’s something you will not soon forget.